"Wi dey gi di World Best red card"
Sierra Leone’s third national elections since the end of its civil war will take place on November 17th. In the nation’s capital businesses are open, and civil servants are in their offices. Five years ago it was not like this. In the week up to elections in 2007 the streets were empty. Yesterday if not for the thousands of people who took to the streets for a campaign rally it could have been just like any other day in the hustle bustle of the city. I walked from the Ministry of Finance building on George Street to Siaka Stevens Street, Wilberforce Street, down to Big Market. The dollar boys were standing on the corner of the Access Bank building as usual. 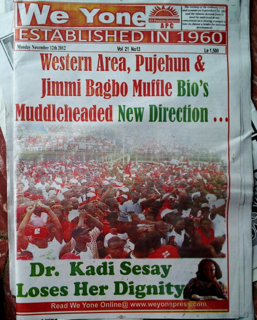 I spoke to the group and though most of them are APC there were a couple of SLPP supporters. They mixed casually there and elsewhere. Political banter from the male traders on the sidewalks was jovial and open. 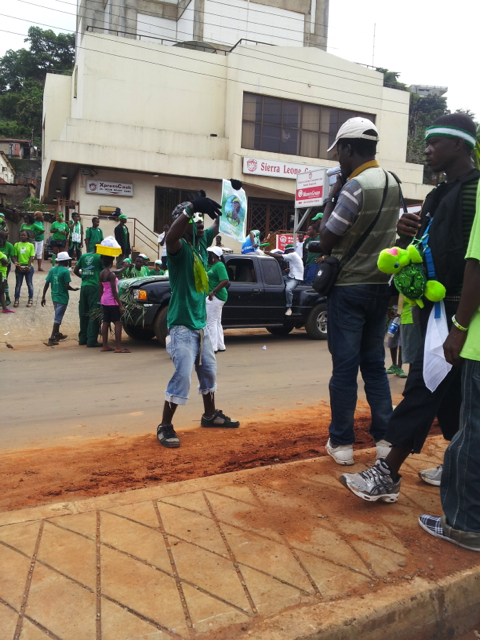 The SLPP supporters I spoke to said they were going to give the President a red card. Football metaphors are very popular during this campaign. It all began when APC supporters put a painting of Ernest Bai next to that of World Best soccer play Leonel Messi. They say he is to the presidency what Messi is to football. 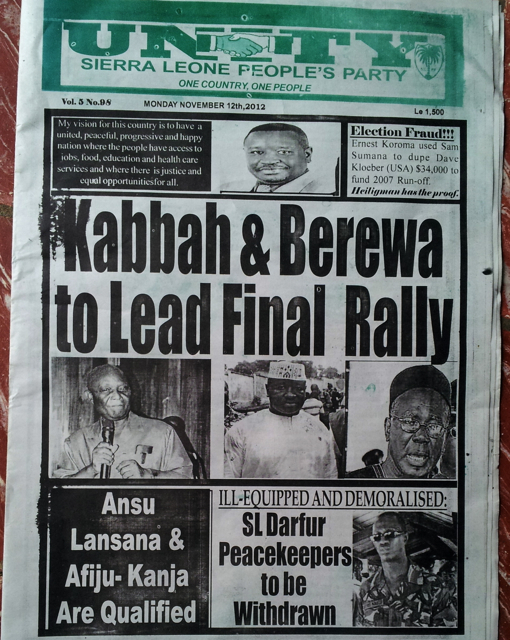 As ‘World Best’ got more and more popular SLPP supporters came up with their response. Now they walk around with whistles and a red cards. They say they are going to give the President the boot. Five years ago during the 2007 elections the city felt was more tense. People had emptied the streets in the days up to voting for fear that fighting would break out. But now there is a different kind of fear. Those in the upper levels of the society on either side of the political aisle worry they might lose. 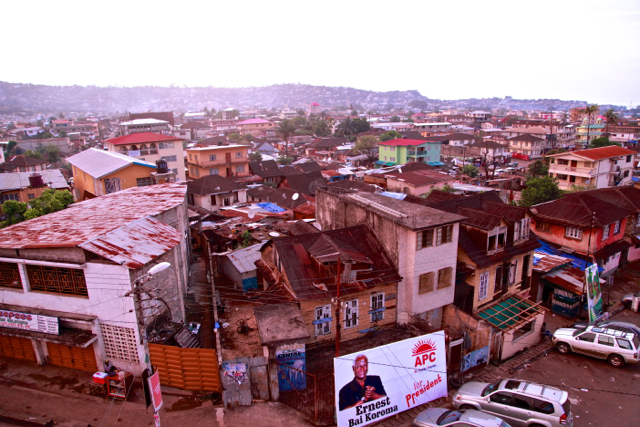 When your party goes out of power in a country like Sierra Leone, it may mean that you will lose your job, or a worse a big procurement contract. 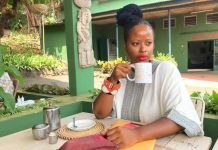 And if you have poured all your finances into the political campaign in hopes of recovering the investment after the elections, a loss could be devastating. 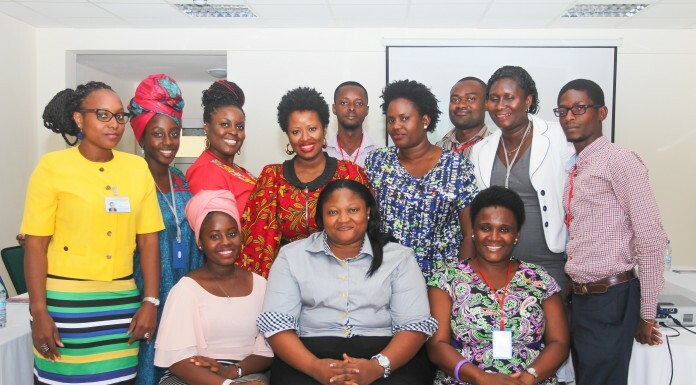 On television the Sierra Leone Broadcasting Corporation . 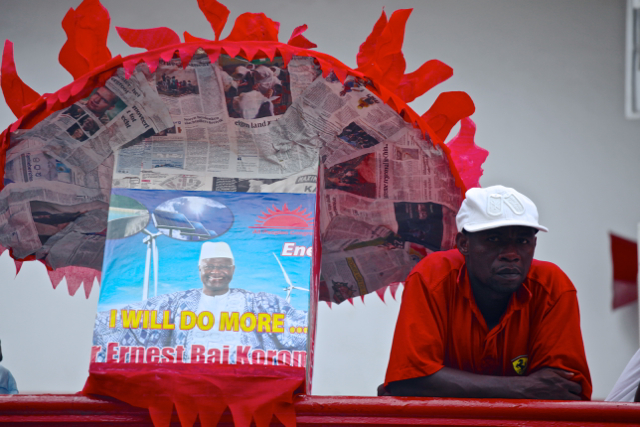 But images of the APC and government projects dominate its coverage. 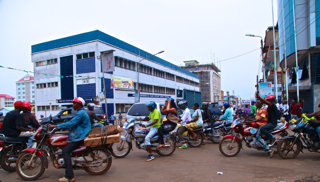 From the solar street light projects, to the new airport, to pipe borne water reaching Kailahun District in the East, the news is all about government achievements. 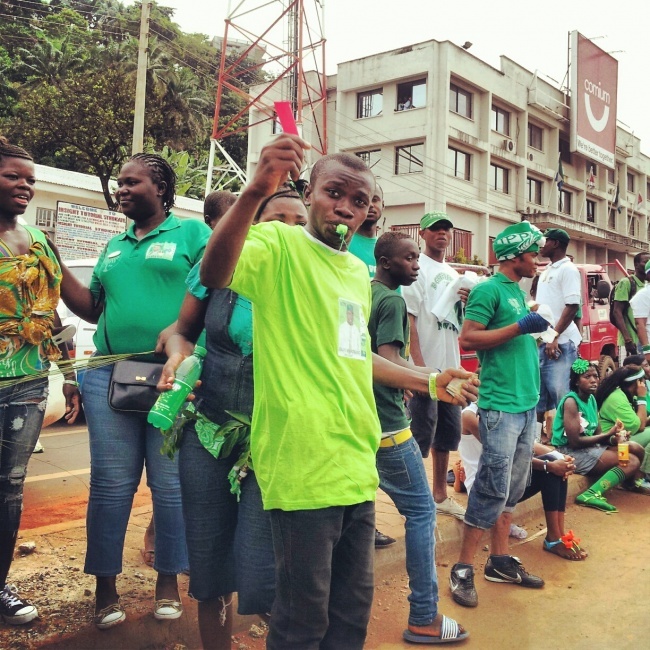 A spokesman for the SLPP appeared on a special program the day before their campaign rally to say that despite being branded as violent, the party was going to keep the peace as they made their way to stadium. And the day of the rally, it was peaceful and merry. 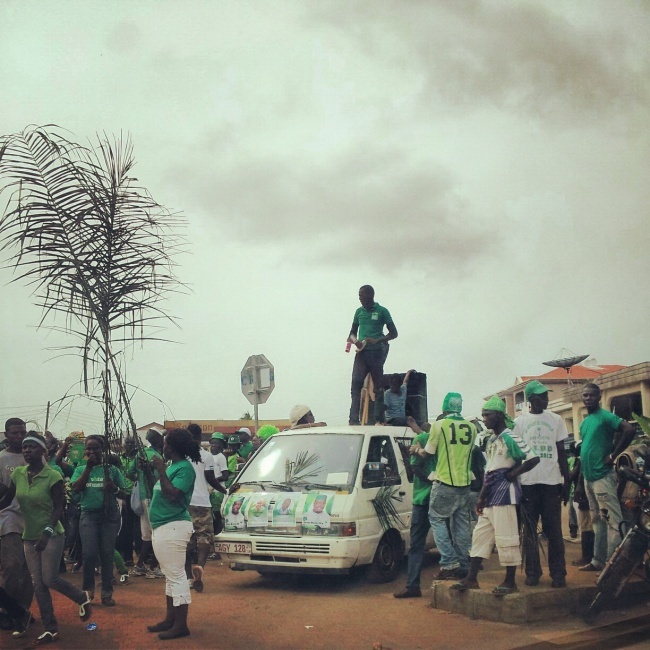 SLPP supporters in their thousands marched through the streets to the national stadium singing, dancing, and chanting. An uncle allied to the APC kept running to the veranda each time he heard noise from the crowds. 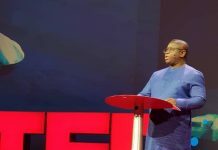 He owns several hotels and properties in Freetown and Port Loko. Win or lose his businesses will be safe. But he is from the North and a friend of the President. As he watched the SLPP supporters stroll pass his 4-storey building on Wilkinson Road, he said, “Ah don tell di Pa say mi noh go lie pan am. We go win oh but runoff must day.” A different tone from weeks ago with APC supporters said it was going to be”wan ten cratch”. 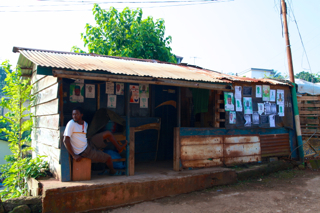 As Sierra Leoneans go to the polls tomorrow, each side predicts a win, but no one knows how the people will actually vote. The supporters of the ruling All People’s Congress (APC) hope that infrastructural development projects will convince voters to give the President 5 more years. 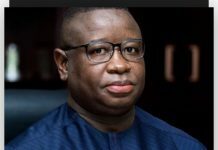 Meanwhile those who support the Sierra Leone’s People’s Party are hoping that bad investment deals, lagging human development, and corruption scandals will make people will vote for Julius Maada Bio’s new direction.